If you've just returned from a safari, or an exotic game hunt, you may have discovered that it's not that easy to find an album that's appropriate for your personal photos. Our specialty is creating the highest quality personalized leather photo albums available anywhere. Each customer's book is crafted to be as unique as the adventures contained within their pages. We can build a custom leather hunting photo album or leather safari photo album for you that will reflect the true essence of your own experiences. Please feel free to contact us, and let us know what it is that you've got in mind for your photo album's design. We'll be pleased to help you work out whatever details may be necessary to make manifest your vision for your photo portfolio. You may choose the type of leather and finish from which your album will be built, and whatever artwork that you like may be fixed upon the cover leather using one or more of several techniques that we've developed to personalize our leather photo albums. All of our personalized leather photo albums are hand crafted to the highest standards in order to produce personalized leather photo albums that will preserve your most important memories beautifully for years and years of future enjoyment. We look forward to hearing from you to discuss your project. If you are returning from an African Safari you'll quickly begin to wonder what you're ever going to do with the countless one of a kind photos that you've captured. Look no further, we build beautiful custom safari photo albums for our customers on a regular basis. 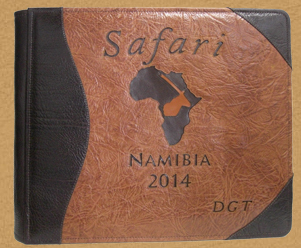 Your personalized leather safari album may be custom crafted to accommodate whatever design that you may have in mind. We'll be pleased to help you develop a design that will reflect the highlights of your Safari so that you can enjoy it for years to come. Please feel free to call us anytime to discuss how we might craft an African Safari photo album for you. Are you looking for a special gift for someone. You may be interested in one of our leather custom photo albums, which may be personalized, and crafted to your specifications. We craft beautiful personalized leather photo portfolios for our customers to accommodate most any need. We'll be pleased to discuss whatever it is that you may have in mind for your leather photo portfolio, then create Photoshop mock up images to help you to develop a suitable design. Once we've created a design that meets your approval, your art will be carefully fixed upon the cover leather of your personalized leather portfolio. All Powell Leather products are assembled from the highest quality materials available, and are assembled with durability and aesthetic appeal in mind. We specialize in hunting photo albums, vacation photo albums, custom modeling portfolios, golfer's photo albums, personalized leather guest books, Safari photo albums, personalized military photo albums, and custom leather presentaion portfolios. Please feel free to contact us any time to discuss how we might create a custom leather album to satisfy whatever your need may be! If you've just returned from Safari, or are looking for an appropriate gift for the hunter in your life, we've the perfect custom photo album for you! 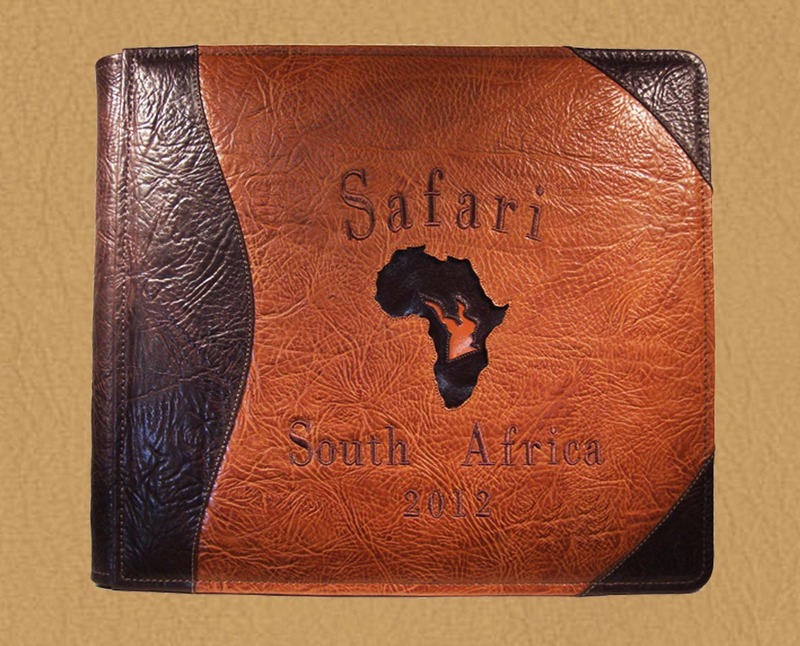 We've custom crafted leather hunting photo albums, exotic hunts albums, African photo albums, fishing photo albums, and safari photo albums for customers in every design style imaginable. We will be happy to work with you to create your cover design and art. All custom leather albums may be crafted in the leather finish of your choice. We craft each Powell Leather album on a per customer basis. Please feel free to contact us anytime to discuss how we may craft a personalized leather photo album to satisfy your needs. You may browse our website to view our other great products like custom leather guest books, leather presentation portfolios, leather photo envelopes, and photography portfolios. Preserve your best hunting memories in a handsome custom leather photo album from Powell Leather. Our personalized leather photo albums are crafted from the highest quality materials available to offer years and years of service. We craft all of our products to a standard higher than any other photo albums on the market today. We can personalize your leather photo album with your name, an animal image, or whatever you like on the cover leather. 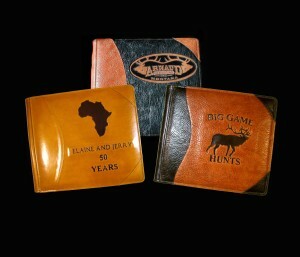 Powell Leather albums are the favorite choice for hunting photo albums, safari photo albums, and fishing photo albums. Please feel free to give us a call anytime to discuss how we may craft a custom leather portfolio for you.